Dissociation is often seen in our child within . When as a child we encounter an overwhelming and terrifying experience, we will dissociate, or mentally separate ourselves from this experience. We will perceive ourselves as detached from our bodies, on the ceiling, or somewhere else in the room watching what is happening to our bodies. We will feel as if we are in a dream or some altered state that is not quite real or as if the experience is happening to someone else. Or we may lose all memories or sense of the experiences having happened to us, resulting in gaps in time or even gaps in our personal history. Our child within will cut off or lose touch with various aspects of our self. Although our child within not be able to purposely dissociate at first, once we have learned to dissociate as a defence mechanism we will automatically dissociate during other stressful situations or when faced with trauma reminders. Dissociation can affect our child’s withins ability to be fully present in activities of daily life and can significantly fracture our child withins sense of time and continuity. As a result, it will have had adverse effects on learning, classroom behaviour, and social interactions. 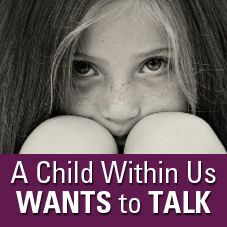 It is not always evident to ourselves and others that the child within is dissociating and at times it appears as if our child within is simply “spacing out,” daydreaming, or not paying attention. Labels: Dissociation is often seen in our child within .